Your All-in-One Guide to Ohio’s Best Outings! If you’ve ever asked, “What should we do today?” then you’ve never seen Ohio Day Trips by Theme. This comprehensive guide to the Buckeye State is jam-packed with hundreds of Ohio’s top spots for fun and entertainment. Take a simple day trip, or string together a longer vacation of activities that catch your interest. Destinations in the book are organized by themes, such as Airplanes & Railroads, Festivals, Outdoor Adventures, and Sports, so you can decide what to do and then figure out where to do it. Useful for singles, couples, and families―visitors and residents alike―this guide by Cathy Hester Seckman encompasses a wide range of interests. Discover the state’s unique attractions―state parks, museums, beaches, winter activities, and more. The book’s handy size makes it perfect for bringing along on your road trips. Plus, with tips for other things to do in the area, you’re sure to maximize the fun on every outing. With Ohio Day Trips by Theme at your fingertips, you’ll always have something to do! Ohio Off the Beaten Path features the things travelers and locals want to see and experience––if only they knew about them. From the best in local dining to quirky cultural tidbits to hidden attractions, unique finds, and unusual locales, Ohio Off the Beaten Path takes the reader down the road less traveled and reveals a side of Ohio that other guidebooks just don't offer. Trees are all around, but how much do you know about them? With this famous field guide by award-winning author and naturalist Stan Tekiela, you can make tree identification simple, informative and productive. Learn about 115 Ohio trees, organized in the book by leaf type and attachment. Fact-filled information contains the particulars that you want to know, while full-page photos provide the visual detail needed for accurate identification. Trees are fascinating and wonderful, and this is the perfect introduction to them. You've seen Ohio's beautiful wildflowers. Now learn to identify them. This is your field guide to 200 of Ohio's wildflowers. Full-page photographs and an easy-to-read format present the information that's critical to accurate identification. And the species are organized by color, so when you see a purple flower, simply turn to the purple section of the book. Wildflower identification has never been easier! Make bird watching in Ohio even more enjoyable! With Stan Tekiela’s famous field guide, bird identification is simple and informative. There’s no need to look through dozens of photos of birds that don’t live in Ohio. This book features 111 species of Ohio birds, organized by color for ease of use. Do you see a yellow bird and don’t know what it is? Go to the yellow section to find out. Fact-filled information, a compare feature, range maps, and detailed photographs help to ensure that you positively identify the birds that you see. The newly updated Northern Ohio Fishing Map Guide is a thorough, easy-to-use collection of detailed contour lake maps, fish stocking data, and the best fishing spots and tips from area experts. Fishing maps, detailed area road maps and exhaustive fishing information for lakes across the state are provided in this handy, 224-page, 8 ½ x 11 spiral-bound volume. Lake maps and fishing information for Lake Erie and over 130 inland lakes, reservoirs, and streams in the northern half of Ohio - from Grand Lake St. Mary's down to many of the small but well-stocked city reservoirs and MetroPark lakes. Includes detailed close-up maps for the western basin of Lake Erie. Whether you re Grand Lake St. Marys for perch, Sandusky Bay for walleyes or exploring the Lake La Su An Wildlife Area lakes, you'll find all the information you need to enjoy a successful day out on the water on one of Ohio s many excellent fisheries. Know your waters. Catch more fish with the Northern Ohio Fishing Map Guide. You may be surprised by just how much history and culture you can experience in just one or two drives through Ohio. Expert travel author and photographer Matt Forster takes you to places you wouldn't guess existed in the Buckeye State, like the Lake Erie Isles—a vacationer's paradise virtually unheard of outside of a few local counties. Head to the Hocking Hills to see waterfalls and gorges along the rivers or visit the vibrant college town of Athens. Want a longer trip? Travel cross-state on the Old National Road or discover local glassmakers still plying their trade in the Western Reserve, where glassmaking history goes way back. Explore Amish country; Native American mounds; the Underground Railroad; Chillicothe; still full of stately mansions; and so much more. With easy-to-follow maps and directions, Backroads & Byways of Ohio will guide you throughout your entire journey and help you make it one to remember. Ohio’s wildlife has always played an important role in the history of human beings inhabiting the state. Native Americans depended on birds, mammals, and fish for sustenance and the state’s first Europeans came in search of Beaver and buckskins. Although the state’s wildlife is still an important resource for human consumption, wildlife is also increasingly important in today’s culture for its intrinsic, aesthetic value. For many Ohioans, the age-old traditions of hunting and fishing have been replaced by a desire to simply observe wildlife and experience nature. But most Ohioans are largely unaware of the diversity of species inhabiting their state. This volume is intended to provide an introduction to the state’s fishes, amphibians, reptiles, birds, and mammals. In The Ohio Wildlife Encyclopedia, nationally known naturalist Scott Shupe has collected information on all the wildlife that reside in the Buckeye State. The first in a series of state wildlife encyclopedias, this book will be a handy, usable, layman’s guide to Ohio’s wildlife. Included are over 800 color photographs, depicting the different species of mammals, reptiles, amphibians, birds, and fish, while also offering over 600 range maps to show their territory. Along with basic information for the biology of each animal, Shupe includes the size, habitat, and abundance of each species located in the state. Whether you’re a lover of the outdoors, photography, or are looking to learn more about your state, this comprehensive guide will teach you about the wonderful wildlife that covers the water, earth, and skies of Ohio. Even if we focus on certain things in the outdoors, most of us are curious about everything else that might turn up. Serious birders, botanists, and entomologists all have their specialized guides, but this book is the guide to “everything else"—the one guide to take when you go out for a walk. Wow, that’s a cool-looking mushroom. Wonder what it is. Hey, look at that weird insect. Birds, mammals, trees, wildflowers, insects, reptiles, amphibians, fish, spiders, mushrooms, ferns, grasses, even constellations overhead and rocks underfoot—it’s all here. With authoritative yet broad coverage, nontechnical language, and more than two thousand color photographs, this book is an essential reference for nature lovers living in or visiting Ohio, Indiana, Illinois, Michigan, Minnesota, Wisconsin, and Iowa. Ah, Ohio, so nice and normal. We have apple pie heroes like Hopalong Cassidy, Neil Armstrong, Thomas Edison, and Doris Day. Our state bird is the jaunty and ever popular cardinal, and our state flower is the carnation, found in the buttonholes of politicians and bridegrooms everywhere. We started America rolling by opening the country’s first gas station, and we have a museum dedicated to America’s music, rock and roll. Why, we’re just so all-American normal, it can bring a tear to the eye. But there’s something else we have a whole lot of, and that’s…weirdness. 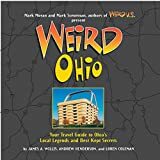 Yes, the Buckeye State has lots and lots of strange people and unusual sites, and they burst forth from every page of this, the biggest, most bizarre collection of Ohio stories ever assembled: Weird Ohio.